After cleansing apply Essence Toner gently over face and neck. Pat dry. Can also be used as a moisturizing spray for dehydrated skin or oily/acne skin. Men can use it as a soothing after shave and a facial hydration system after cleansing. 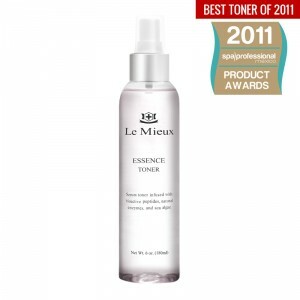 Essence Toner is especially designed for sensitive skin. My favorite toner of all time. Have used it for years. Ingredients: Citrus Aurantium Dulcis (Orange) Fruit Water, Malpighia Glabra (Acerola) Fruit Extract, Hyaluronic Acid, Magnesium Aspartate, Zinc Gluconate, Copper Gluconate, Porphyra Yezoensis (Algae) Extract, Palmitoyl Tetrapeptide- 7, Camellia Sinensis (Green Tea) Extract, White Tea Extract, Avena Sativa (Oat) Extract, Vitis Vinifera (Grape Seed) Extract, Sodium Carboxymethyl B-Glucan, Citrus Medica Limonum (Lemon) Peel Extract, Superoxide Dismutase, Glucosamine JHCL, Saccharomyces Lysate Extract, Pentylene Glycol, Beta Glucan, Rosemarinus Officinalis Extractt, Sodium Hydroxyl-Methyl Glycinate Vaccinium Myrtyllus (Bilberry) Extract, Bladderwrack Extract, Phyllanthus Emblica Fruitl Extract.